Scream Factory has detailed their upcoming 8MM blu-ray, streeting in January. The film, starring Nicolas Cage and Joaquin Phoenix, was a decent enough hit at the box office, grossing more than $95 million worldwide. 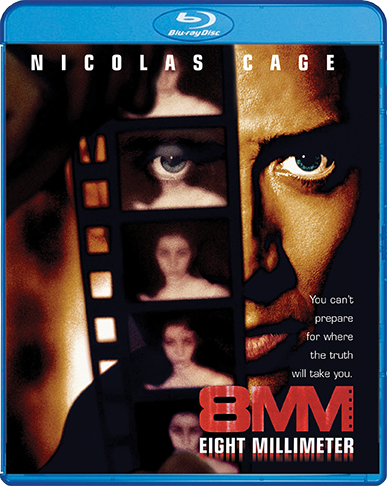 An in-name-only sequel, titled 8MM 2, was released in 2005 straight to dvd with none of the original cast or crew. Fans of the film have been asking for a blu-ray of 8MM for years now and it is nice that Scream Factory stood up to answer the call. Academy Award® winner Nicolas Cage (1995, Best Actor, Leaving Las Vegas) stars with Joaquin Phoenix (Walk The Line), James Gandolfini (The Sopranos) and Catherine Keener (Get Out) in an electrifying thriller from the writer of Se7en. Directed by Joel Schumacher, this dramatic story follows one man's obsessive search to the truth about a six-year-old crime – and his ultimate discovery of the truth about himself.